Ages ago we used to carry a steel box, or a plastic box which would leak here and there, create an awkward situation cleaning all that in front of our friends. And then we would think of our kids their situation in school and college among their friends. Then someone suggests you to buy Tupperware, and assure you that it will be air tight, don't leak and very impressive. We ask two or three more friends, and re-think on the cost and buy that. We see the results and we are satisfied. In a couple of months or so, we probably would replace our whole kitchen set by Tupperware. Do you the know origin of Tupperware? It was first introduced to the public in 1946. It has an independent sales force of approximately 1.9 million consultants, sold in almost 100 countries. This is an achievement of any entrepreneur. No doubt this fact is superb and fantastic. But have you ever thought how can a product be so perfect? Is it safe? What material is used? 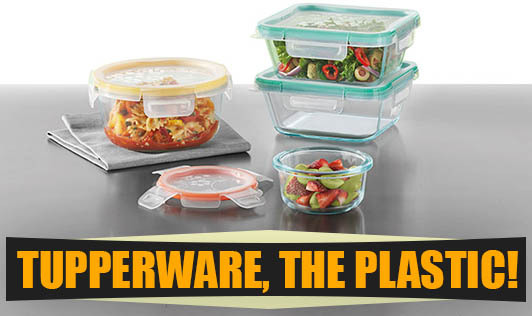 Tupperware use a type of material called polycarbonate. Polycarbonate is a very durable material. Although it has high impact-resistance, it has low scratch-resistance and so a hard coating is applied to polycarbonate eyewear lenses and polycarbonate exterior automotive components. Unlike most thermoplastics, polycarbonate can undergo large plastic deformations without cracking or breaking. The use of polycarbonate containers for the purpose of food storage is controversial.The basis of this controversy is their hydrolysis (degradation by water, often referred to as leaching) releases bisphenol A. More than 100 studies have explored the bioactivity of bisphenol A derived from polycarbonates. It is still a controversy. World Standards: All Tupperware products are made from safe, non-toxic, non-carcinogenic materials; thus they do not release harmful chemicals to food or liquid contents. Materials & Additives used exceed US Food & Drug Administration (FDA) & Japan Polyolefin Hygienic Association standards. Colour Safe: Assured that colorants used are all registered on the French Positive List, Circular Letter No. 176 (the most stringent in the world). It also complies with Council of Europe Committee of Ministers Resolution AP (89) 1 requirements. Microwave Safe: Tupperware products are indicated for microwave used; Tupperware uses materials strictly meant for microwave use & adhere with the many international bodies. It means you can use it with peace of mind every time!